Cool pics Qjet Got any history on this one? 70 Bumper but has wing vent windows? Its a 1968 with a 1969 front clip! Last edited by vistacruiser67; January 13th, 2015 at 08:47 AM. this is what the mondello car looked like when my dad picked it up ! I dont know anything about the history of the car. I cant remember where I got the picture. Out of all these hundreds of pictures I've posted only 3 are mine. which 3 cars are yours? Does that say D/SA on the window? fast class for olds to be compete in do you still race a olds? I saw this brown car run in the high 11s and low 12's in the 80s. Bill Hudson was a local Olds backed racer. The fastest car Ive had was that 442 in the small picture at the bottom of the post with the red trunk. Its only run 14.6 and hangs out at 14.9 to 15.1. It needs better brakes though. Its got drums front and rear. Factory AT on the column with buckets, non air, non power brake car. Nordic blue was the original color. It didnt have the factory 455 when I got it so I put a 71 Vista Cruiser 455 4bbl in it. 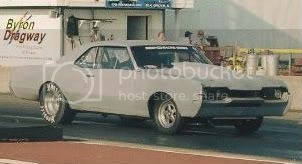 Ive raced some Vista Cruisers and Cutlass Cruiser Wagons over the years, a couple of 4dr Cutlasses. Mostly smallblock Olds in those. I only got those in the low 16s which was pretty fast in the 80s for street racing. No fast now though. Last edited by vistacruiser67; January 23rd, 2013 at 05:49 AM. Let's Go Racing, Racing, Racing! You race guys seem to have been holding out on us for the last few years. Thanks for finally coughing up the pics!